RD, Ethernet Tag ID and MPLS Label fields will be used as defined in RFC7432. 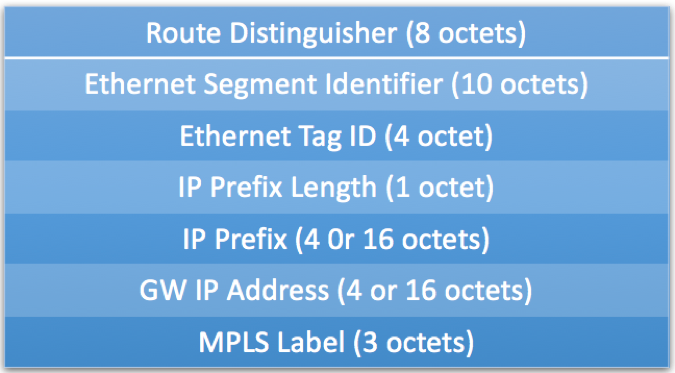 The Ethernet Segment Identifier will be a non-zero 10-byte identifier if the ESI is used as an overlay index. It will be zero otherwise. The IP Prefix Length can be set to a value between 0 and 32 (bits) for ipv4 and between 0 and 128 for ipv6. The IP Prefix will be a 32 or 128-bit field (ipv4 or ipv6). The GW IP (Gateway IP Address) will be a 32 or 128-bit field (ipv4 or ipv6), and will encode an overlay IP index for the IP Prefixes. The GW IP field SHOULD be zero if it is not used as an overlay index. The MPLS Label field is encoded as 3 octets, where the high- order 20 bits contain the label value. The value SHOULD be null when the IP Prefix route is used for a recursive lookup resolution. Prefix Advertisement draft introduces the concept of ‘Overlay Index.’ When an overlay index is present in the Route Type 5 advertisement, the receiving Network Virtualization Edge (PE) will need to perform a recursive route resolution to find out to which egress NVE (PE) to forward the packets. The route will contain a single overlay index at most, i.e. if the ESI field is different from zero, the GW IP field will be zero, and vice versa. The route will contain a single overlay index at most, i.e. if the ESI field is different from zero, the GW IP field will be zero, and vice versa. Receiving PE will need to do a recursive lookup to determine reachability to 1.1.1.100 Gateway Address.